Online Magazine Software - create flipbooks with page-flip effect. A documented strategy makes a difference, as 84 percent of marketers who say they are ineffective at content marketing said they have no documented strategy. B2B marketers who have a documented content strategy are far more likely to consider themselves effective (66 percent vs. 11 percent). Not only is the adoption of content marketing on the rise (93 percent of marketers use content marketing this year compared to 91 percent last year), but 42 percent of B2B marketers consider themselves effective at content marketing, up from 36 percent last year. B2B marketers are using all social media platforms to distribute content more frequently than they did last year. In addition, they now use an average of six platforms, versus five last year. The social media platforms that have experienced the biggest surges in use, year over year, are SlideShare (40 percent vs. 23 percent), Google+ (55 percent vs. 39 percent), and Instagram (22 percent vs. 7 percent). Each year we ask marketers to rate the effectiveness of traditional tactics, but this year we also asked them to rate the effectiveness of social media platforms. Similar to what we’ve seen with traditional tactics, there is uncertainty in terms of effectiveness. LinkedIn is the only platform that the majority of B2B marketers consider to be effective. Fifty-eight percent of B2B marketers plan to increase their content marketing budget over the next 12 months, up from 54 percent last year. 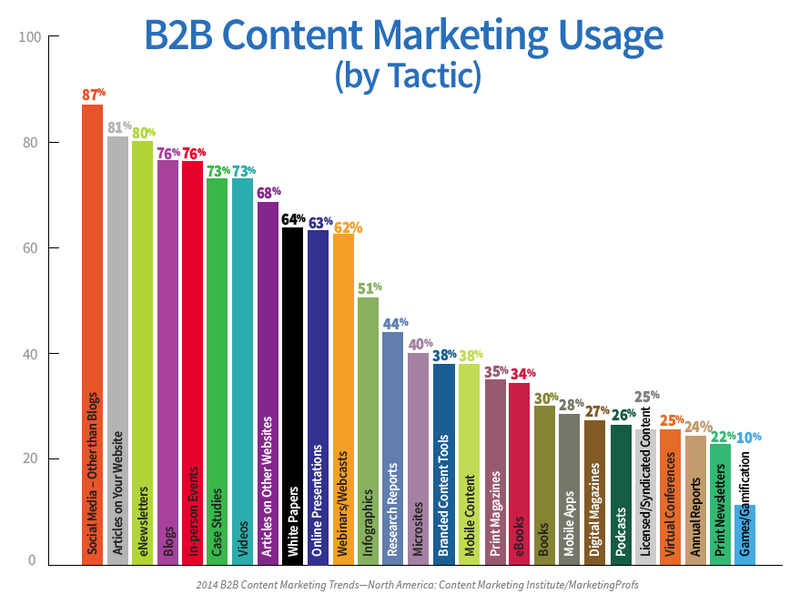 What are best-in-class B2B content marketers doing differently than their peers? What type of functions are B2B marketers outsourcing (a new question asked this year)? What are the primary goals for content marketing — and what are marketers doing to measure success? How are marketers tailoring content? (McGraw-Hill) will be released in the fall. If you want to get on his good side, send him something orange. For more on Joe, check out his personal site or follow him on Twitter @JoePulizzi. Flipbook Software to create e-magazines, e-brouches, e-catalogs, e-books and other digital publications from PDF, SWF, JPG, PNG or GIF images. Tomorrow is Wednesday. If this is true, what day is today? What could you recommend in regards to your submit that you made a few days ago? I observe that your specific knowing of the topic is actually strong as well as thorough. Such a goody to find someone composing whom not simply possesses knowledge but in addition the possibility to connect via simple to visualize as well as recall info-bytes. Blog much more! Hipolito M. Wiseman on Create digital publications with page-flip effect from PDF, SWF, JPEG, PNG and other image files. coach bags on Hello world! Issac Halvorsen on Hello world!